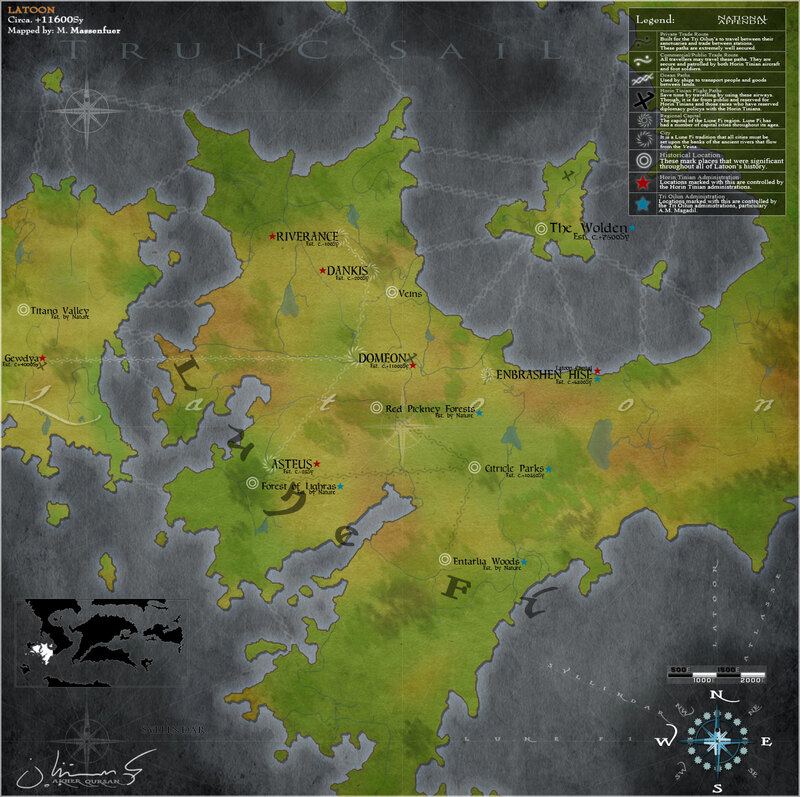 This is a mapmaking competition entry from AkherQursan. The capital region of Latoon. Mainly inhabited by a race named Horin Ti. “Low in the valleys you will find crumbled cities that were once home to some of the greatest civilizations ever noted by this world’s famous historians. Copyright info for this map: BY-NC-ND Creative Commons. Very stylish with a strategy video game look. I pretty map, nicely executed. It comes off a little flat, and the lines are a bit curious, but I like the overall effect. That’s a wonderful map, with great typography. Mountains might have come out a little more strongly. I love the informational content with the small overview map showing the location of the area in the grand scheme, and the map key. Great work. I love the textures and color palette you used. Also the mapping elements you used are very refreshing giving it a real fantasy look. I think the other elements (scale, legend and overview map) are a little disconnected, as they have a very modern look while the map itself has a more ancient look to it. Colours, legend, symbols, the small inset map – very good work. The only thing which looks not completely in line with the style is the dropshadow applied to the land. Everything else – beautiful. This is very pretty. I love the colour palette and the decorations. It’s very easy on the eye. It’s stylishly done and easy to read. My problem is the rivers. You have rivers that split and join. There are rivers that run from sea to sea. Rivers flow downhill and almost never split as they run to the sea. The waterways on this map are entirely unphysical so I had to pull back some marks on that. I was also a little unsure that the transit paths would be as dead straight as you’ve marked them. A terrain of canyons and great beasts would suggest more circuitous routes than you show, but I can see that there might be reasons for that – depending on the tech level. I love the patterns you’ve used to depict the routes – they’re very evocative. I also love the inset on the map showing the location in the world.